Dissident republicans suspected of being responsible for a weekend car bomb are impervious to appeals to stop their violence, an MP has said. The DUP’s Gregory Campbell was speaking as speculation linked the attack to today’s centenary of Ireland’s War of Indepedence. 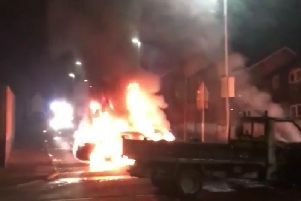 Screengrab from CCTV footage dated 19/01/19 issued by the PSNI showing a car bomb exploding outside the court house on Bishop Street in Londonderry shortly after 8pm on Saturday. Paramilitaries hijacked a pizza delivery vehicle, packed it with explosives and detonated it at Londonderry’s courthouse on Saturday night. The PSNI suspects a group calling itself ‘the New IRA’. Children at a church club and hotel guests were among the hundreds of people police shepherded away after a bomb threat was received. There is speculation in Londonderry that the bomb may have been planted outside the courthouse to mark the 100th anniversary of the start of the Irish War of Independence, fought between January 21, 2019 and July 1921. East Londonderry MP Gregory Campbell said this was “the most likely rationale” and “the one that’s getting most traction”. He added: “This then begs the question for the group behind this, which is ‘would our great grandchildren then have to endure a 200th anniversary bomb in 100 years time’, because that is the logic of this nonsense. “If they are going to plant a bomb to commemorate the 100th anniversary of the so-called War of Independence then will a subsequent group be doing the same in a hundred years time? Mr Campbell said it is “pointless” for politicians to make calls for the dissidents to end their campaign of violence, adding: “They simply won’t desist. These people don’t listen to calls from me or anyone else to stop. His party colleague, Foyle MLA Gary Middleton, said he too has heard speculation about the attack being linked to the anniversary of the Irish War of Independence.